Posing as amateur musicians, Professor Marcus and his gang rent rooms in the lopsided house of sweet but strict Mrs Wilberforce. The villains plot to involve her, unwittingly, in Marcus’s brilliantly conceived heist job. The police are left stumped but Mrs Wilberforce becomes wise to their ruse and Marcus concludes that there is only one way to keep the old lady quiet. With only her parrot, General Gordon, to help her, Mrs Wilberforce is alone with five desperate men. But who will be forced to face the music? The set was ingenious and worked well, if a little cramped on the upper level. Liz Saxton was totally believable as the landlady, Mrs Wilberforce, whose credibility is questioned following an unfounded report to the police concerning the local shop owner. Her obsequiousness towards those with a ‘title’ was a sight to behold. PC McDonald although only a small part, was played very sympathetically by Lauren Eeley. Mrs Wilberforce is totally conned by Professor Marcus, who was gentle and convincingly played by Paul Shave. Wishing to rent her spare room to plan a heist on a cash delivery lorry, he imports the rest of his gang. There were some nice touches with Marcus’s long scarf and attempted straightening of the picture. The gang gradually appear and, unaware of their given aliases, swiftly assume the fake roles and the pretence of being a string quintet. Harry (George Buckland), the wide-boy, was slick and confident displaying comedic confusion when details were queried. Major Courtney (Andrew Alexander) appeared stressed and nervous throughout as a result of purported PTSD, although his passion for female clothing was well expressed. Lawson – One Round – (Cameron Pearce) was not the brightest member of the gang and carried this off very well, being finished off by a stabbing to the head which was said to have ‘missed his brain’. Louis (Chris Kendrick) was frightening in his appearance and stature, with a good Romanian accent, maintained his threatening manner throughout. The comedy was brought out well by the cast and the ‘concert’ by the quintet was a triumph, Mrs Tromleyton, (Ann Griffiths) who wowed us all by her expressions of appreciation to the cacophony along with her troupe of extras. Mrs Wilberforce insists on informing the police of the robbery and Marcus decides that she must be killed, but are pre-empted by what they think is her demise, only to be foiled, as she is asleep. The Major’s confidence blossomed in the handling of the situation. As one by one the entire gang are eliminated she is left with the cash. However, having been previously discredited by the police they are convinced it is a figment of her imagination and tell her to forget the whole thing. Mention must be made of ‘General Gordon’, the unseen ailing cockatoo, who was ably voiced by Naomi Read and the excellent sound effects and choice of music, which really set the atmosphere. A well performed play, enjoyed by the enthusiastic audience, despite a couple of technical hiccups. Congratulations to all. William Rose wrote the Bafta-winning screenplay for the classic Ealing film that Graham Linehan’s stage play is based on. It was directed by American-born Scot Alexander MacKendrick and was an instant success, highlighting post-war woes in 1950s Britain with plenty of ironic humour. Successful performance depends on portrayal of six very strong, well-drawn characters. In this production, only Paul Shave with his portrayal of the smooth-talking, but ultimately sinister, Marcus and Chris Kendrick as Louis, the foreign criminal and killer, really worked well. Harry the teddy boy, all mouth and little substance, was played by George Buckland and the smooth conman ‘The Major’ by Andrew Alexander. One Round, a burly ex-boxer, was played by Cameron Pearce, who wasn’t really built for the part – not his fault of course. Mrs Wilberforce, an old lady who is full of fantasy imaginings, but quite resolute when it matters, was played by Liz Saxton, who worked hard, but moved too quickly across stage on some occasions for a woman in her late 70s. There was a good cameo by Ann Griffiths as a friend of Wilberforce and Naomi Read, who was never seen, only heard, as General Gordon the parrot. She had the easiest part in a difficult production. Buckland, Alexander and Pearce all delivered their comic lines with good timing and movement, but the characters they played were one dimensional. Even Paul Shave could have been a bit more sinister towards the end, but he did a good job of portraying the creepy, rather slimy master criminal organising a major robbery. This was not an easy play to perform and the script failed to make clear some of the main points of the original screenplay. Those points were brilliantly highlighted in the film, where the use of outside locations for the robbery and a cameo comic turn by Frankie Howerd added to the storyline, as did Mrs Wilberforce’s regular visits to the local police station to report aliens in her garden. Lauren Eeley played a policewoman convincingly in a small part. Overall though, the difficult characterisations proved a bridge too far for most of the cast. 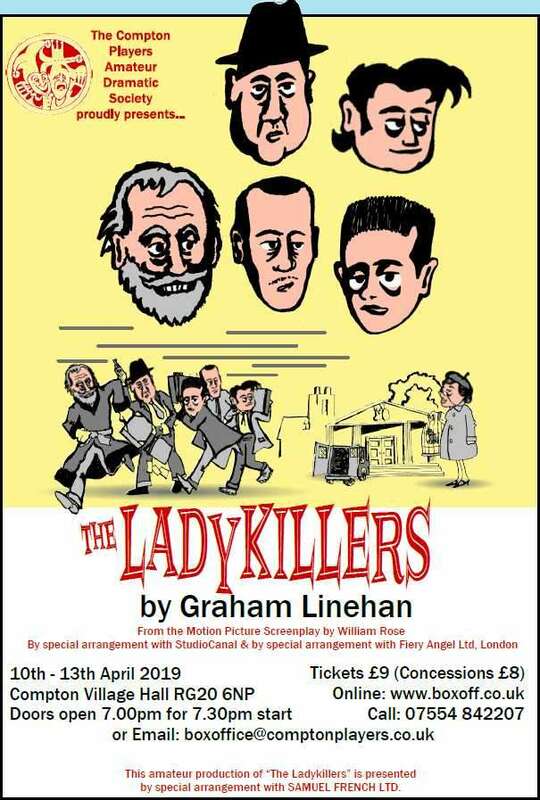 THE LADYKILLERS by Graham Linehan is set in post-war Britain and is a black comedy farce about a band of criminals, masquerading as musicians who use the lopsided house of a sweet an unsuspecting old lady (Mrs Wilberforce) as cover for the heist they are planning. When she is involved, they decide she must be eliminated and what results is an evening of joy as the group end up killing one another rather than despatching her! FRONT OF HOUSE: The Front of House team welcomed the patrons in readiness for the show, ensuring a happy and relaxed atmosphere with refreshments offered before the show and in the interval. SET: The split-level set was well designed with sliding panels to reveal the rooftop, another fold out depicting the tunnel, a cupboard to house the criminals. The gauze curtain showing the row of terraced houses was backlit when the action began, giving us the impression of looking through the window. This was a stroke of genius. COSTUMES and hair-styles were appropriate for the period and added to the nostalgic feel of the production. THE PRODUCTION: This was an ensemble piece and each cast member helped evoke a life of post-war England when the country was going through a historically fundamental revolution. The Major a representation of military ruling class, the brutish ex-boxer representing the working class masses, Louis the foreigner. Liz Saxton was just perfect as the deeply honest Mrs Wilberforce whose morals would not allow her to condone the dishonesty of the men, even when threatened with danger. She had fine support from Paul Shave as the mastermind “Professor” Marcus and George Buckland had great cockney charm as light-fingered Harry and his obsessive need to polish. This gentle comedy bubbled along nicely and the opening and linking music added to the period feel of the evening. Director Pete Watt bought us an evening of light relief and the audience went home with smiles on their faces.